English Whisky Aims To Give Scotch A Run For Its Money : The Salt When you think whisky from the U.K., you think Scotch. But a group of entrepreneurs is trying to restart England's long-dormant whisky business — and prove their version of the quaff can be jolly good, too. English whisky is headed stateside in April. 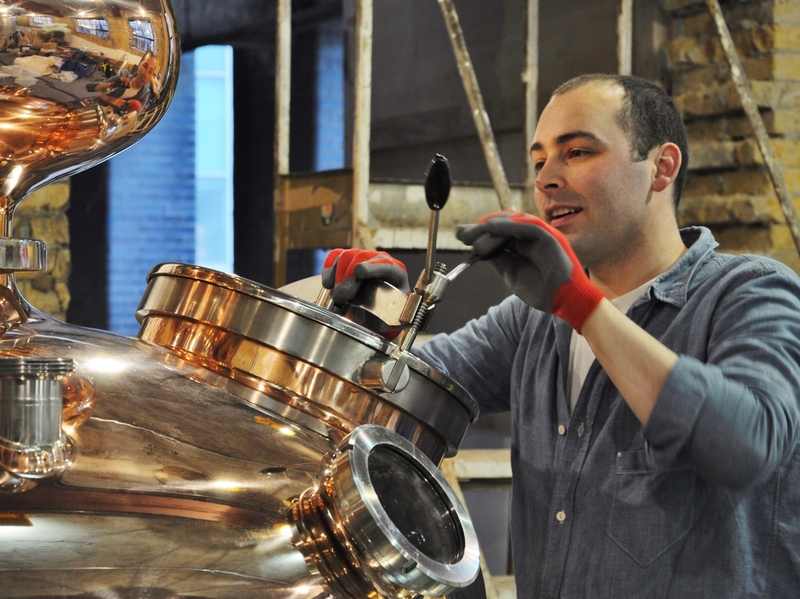 Darren Rook checks out a new still at The London Distillery. Move over, Scotland. It's time to make room on the shelf for English whisky. London's first distillery in over a century is about to begin production of single malt whisky in a former Victorian dairy. Darren Rook and his partner decided to open The London Distillery after reading about Australian distilleries. "We wondered why there were none in London," he tells The Salt. Actually, London did have a distillery, once upon a time: Lea Valley Distillery, located at the site of the recent Olympics, was one of four English whisky producers in the 18th and 19th centuries. But it put out its last cask of whisky in 1897. So why did English whisky production shut down for more than a hundred years? Whisky historian and author Kevin Kosar says it all came down to supply and demand. "The whisky market crashed in 1900," he tells The Salt. "Leading up to that time, the Scots and Irish were overproducing whisky, causing prices to drop and distilleries to go bust." Kosar says because of the long lead time involved in the production of whisky, many distilleries overleveraged themselves. "Distilling, whisky especially, is very costly. You put all this money out there for the equipment and staff, then you put it in casks and wait three years. There are a lot of upfront costs with delayed revenues." In order to generate income more quickly, many distilleries, including Darren Rook's, also distill gin, which only takes about three weeks to produce. Andrew Nelstrop has been at the forefront of the English whisky revival, with his St. George's distillery in Norfolk, producing whisky since 2006. He believes English whisky also suffered because of the suppliers servicing the heart of the market. "England became the capital of gin, and Scotland became the capital of whisky," he says. "Whisky needs to go into oak casks. Most of the oak casks arrived at the docks in Liverpool. By the time the English were producing whisky, which was much later, most of those casks were heading north, not south. If you haven't got enough casks to pour your whisky, you're out of luck." But casks are no longer a problem. And Rook says only the Scots and Americans are bound by law to use oak. "We're going to use some oak casks, but we're also going to experiment with other woods to see how it affects the flavor." Rook's whisky won't be bottled for another three years, but Nelstrop's St. George's whisky will begin exporting to the U.S. in April. Nelstrop concedes Scotch has an advantage, being a brand in itself; only Scottish whisky can be called Scotch. Instead, he's hoping to trade in on England's identity and heritage. "When people think of England, they think of quality products," Nelstrop tells The Salt. "Think of Rolls Royce, Bentley and others. We need to provide a high-quality whisky to match the expectation." Rook compares Scottish whisky to French wine. "Scotch will always be the standard-bearer for quality," he says. "We're not here to compete with the Scots. We're trying to create something complementary. We're trying to create something we're passionate and proud of, that people can see as a separate offering to excite and engage whisky drinkers in a different way." Rook says there are many English microbreweries now trying to enter the whisky market. He predicts a surge in craft distilleries, but cautions the novelty of English whisky is just that, and only those pouring quality from their casks will survive against their Scottish rivals. P.S. If you're thinking there's a typo in the spelling of "whisky," it's because Scottish and English whisky producers spell the word with no "e." The letter was used by the Irish years ago to differentiate their product, and Americans followed suit.